This gallery is 10 feet high and 6 feet deep. The string of birds moving across this gallery are made of plaster of paris. They break when hit, but are easily replaced. The squirrels running up and down the trees on either side break when hit, and are easily replaced. The owl, when the bull's eye on breast is hit, flaps its wings. The hound and rabbit crossing the knoll show bullet marks when struck. The ape and Indian disappear when hit, and automatically erect themselves upon next appearance. The men crossing the bridge on the goat, giraffe and rhinoceros disappear when hit, and automatically erect themselves upon returning. The lion, when the protruding heart target is struck, drops his head and reappears a moment later, ready for another shot. The line of targets on the back of the stream have the following action when struck by bullet. 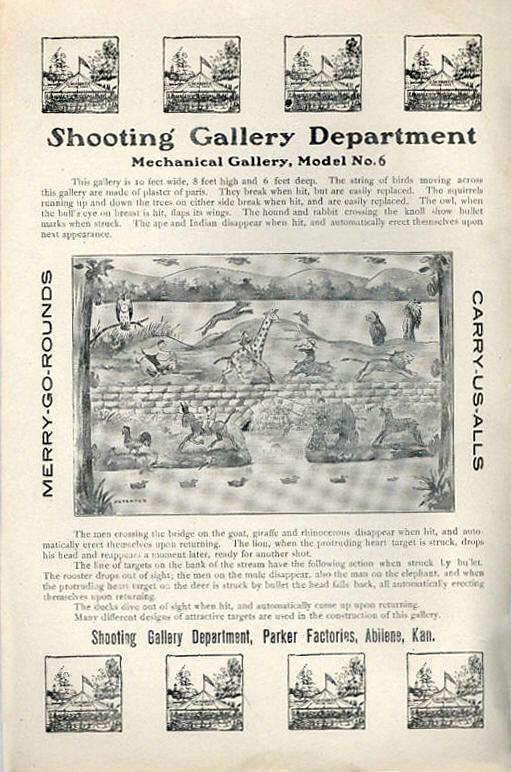 The rooster drops out of sight; the men on the mule disappear, also the men on the elephant, and when the protruding heart target on the deer is stuck by bullet the head fulls back, all automatically erecting themselves upon returning. The ducks dive out of sight when hit, and automatically come up upon returning. Many different designs of attractive targets are used in this cons traction of this gallery.